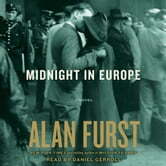 The latest novel from New York Times bestselling author and the "modern-day master of the genre" (Newsday), Alan Furst. From the New York Times bestselling author and the acclaimed "grandmaster" of espionage (Boston Globe) comes the taut, suspenseful story, set in Paris and Spain, of a man caught in the turmoil of the Spanish Civil War, and an operation that—with the help of FDR's secret operatives—will determine Europe's fate in the coming world war. New York City, autumn 1938. Gregorio D'Alba, a minor noble descended from the Spanish Bourbons, is awaiting passage on a freighter to Paris after a failed attempt to convince American oil companies to support the Republican side in the Spanish Civil War. In Paris, surrounded by shifting political allegiances and prying spy services, D'Alba does whatever he can to support the Spanish Republic--smuggling, gathering intelligence, running arms. But the stakes quickly escalate when D'Alba, along with the British and the Americans, undertakes a mission to infiltrate the highest levels of the Spanish government, and to determine the alliances of his country and forever alter the course of the coming world war. With his signature gripping, heart-pounding story, Alan Furst's new novel confirms his status as "the most talented espionage novelist of our generation" (Vince Flynn).